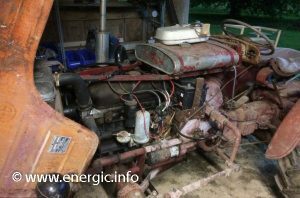 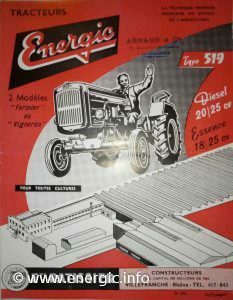 Energic 519 Tracteur Petrol (available from 1955). 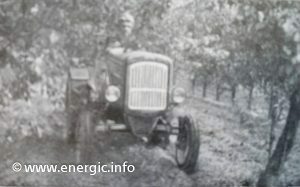 Farmer model A (full size) version. 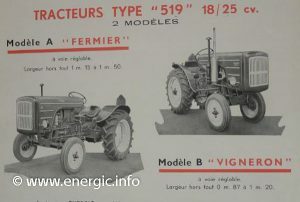 Vigneron Type B (narrow) version. 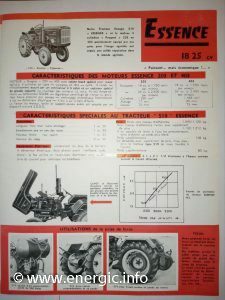 Available initially in 1955 with 2 petrol engines; Peugeot 203 18cv at 1750 rpm/ 25cv at 2400 rpm 1290cc alésage 75mm x course 73mm and later Peugeot 403 19cv at 1750 rpm/ 26cv at 2400 rpm 1468cc alésage 80mm x course 73mm either narrow/vigneron (.87m to 1.2m) or standard/Fermier (1.15m to 1.50m) models where available. 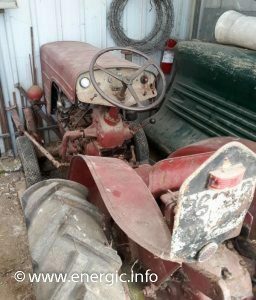 Motor 4 cylinder, 4 stroke (4 temp) OHV (Soupapes en tete), liquid cooled radiator with 6 blade fan, gear box available in 4 forward speeds and 1 reverse or 6 forward and 3 reverse gears. 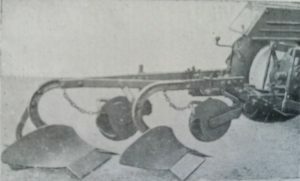 Differential blockable by foot pedal (for very poor terrain where additional non slip traction is required), PTO (prise de force), hydraulic rear arm lift 3 point (relevage automatique) Dynabloc, Electric starter, lights front and rear, braking independent for each wheel or bloc together ( a hand brake is also available operating on the 2 back wheels as normal breaking). 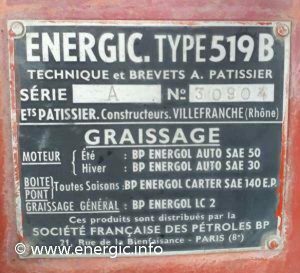 Batterie 12v 45/60amps, air filter in a bath of oil, high pressure oil pump, Carburettor Solex, Single disc clutch, Reinforced tubular front axles to with stand greater loads and width adaptability.Bonnet hinged forward for easy access to engine components, oil, fuel and servicing. 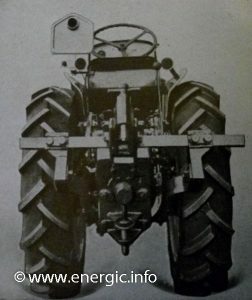 Gear ratios/speeds at 2000 revs. 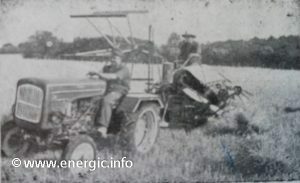 per min. 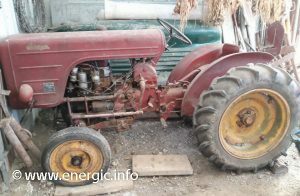 ;1st 2.8kms, 2nd 4.6kms, 3rd 6.7kms and 4th 18kms. 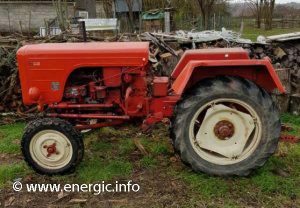 Fuel consumption: 2 and 1/4 to 2 and 1/2 liters per hour. 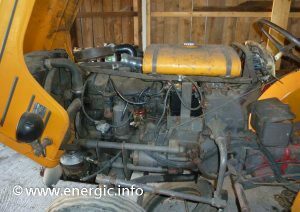 depending upon the work/engine load. 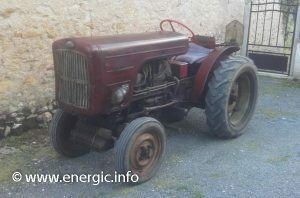 Dimensions: Length 2.5m, width 1.5m, height to bonnet 1.25m, seat height 0.9m. 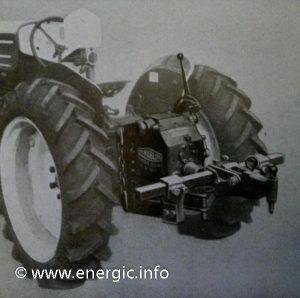 Adjustable widths; 2 types of tractor; Narrow .87m to 1.20m. 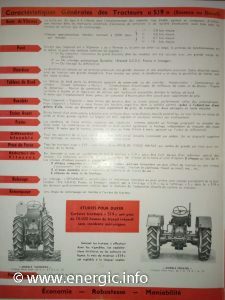 Standard 1.15m to 1.50m. 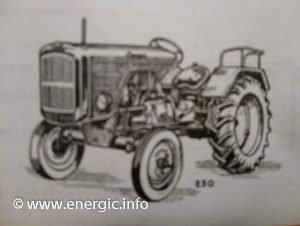 Weight: Between 1,040kg and 1,120kg (different engines). 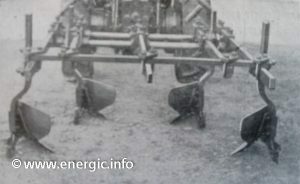 With masses 1,132kg/1,212kgs. 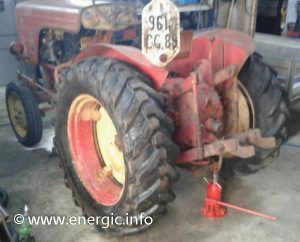 You can add water into the tyre to add 118kg in total. 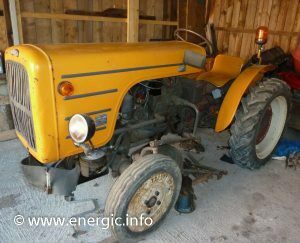 Energic 519 petrol tracteur 519A. 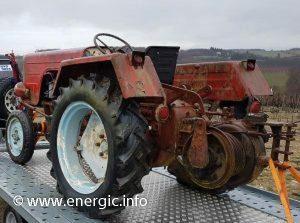 Optional extras/implements: Heavy wheels front + 80kgs. 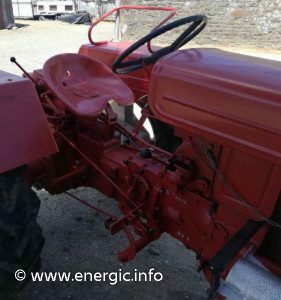 An additional gear selector, which doubles the number of gears to 8 gears.The 8 gears give the following ranges:3 gears for when very slow to slow speed is required, 3 speed normal range usage and 2 for high speed such as road work. 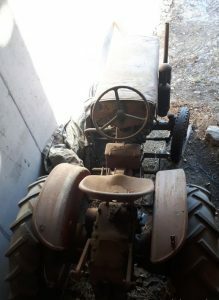 Passenger seat on the normal tractor both sides. 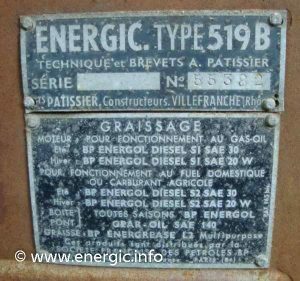 Instrument panel It had the following gauges and switches; Oil pressure light, temp. 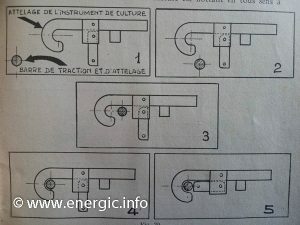 gauge water, Amp gauge, light switch, pre heater switch/bar, motor stop button, manual accelerator lever, pre heater visual coil. 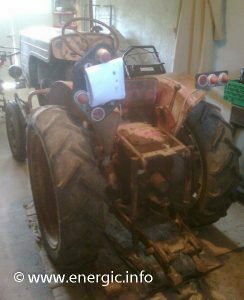 Optional extra; tractor working hours counter. 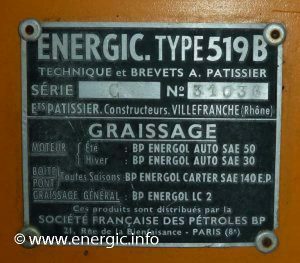 There is a fuse box that is easily access able behind the instrument panel. 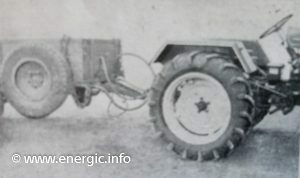 Tyres/Pneu. 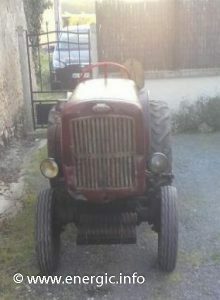 Front/avant 400 x 15. 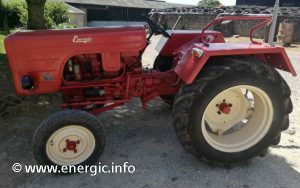 Rear 8 x 24 or 9 x 24 or 900 x 24(11 x 24) + supplementary price. 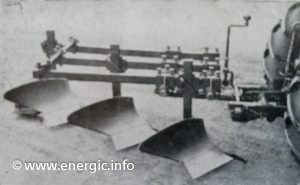 PTO additional equipment usage / utilisation de la Prise de force. 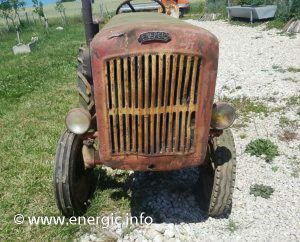 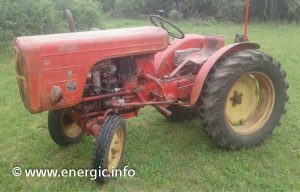 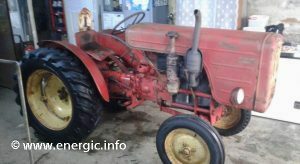 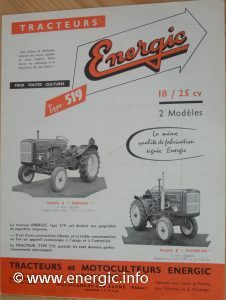 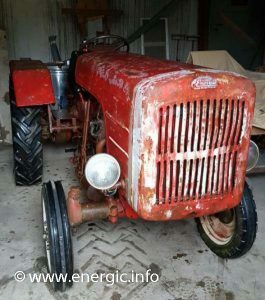 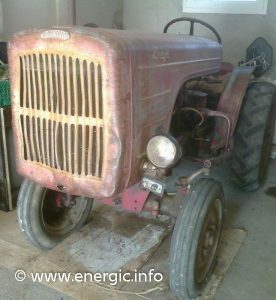 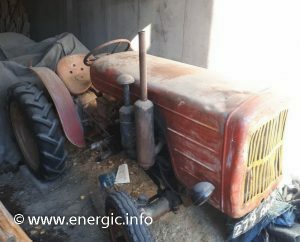 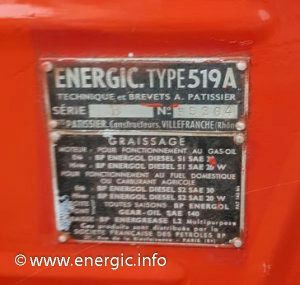 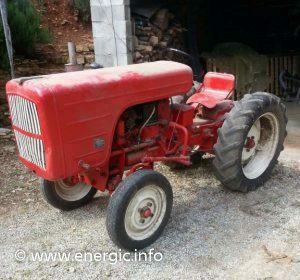 Energic 519 petrol tracteur 2 models A & B vigneron. 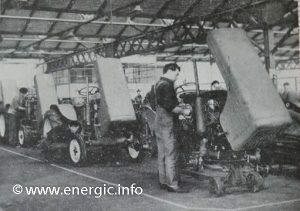 Dynabloc S (Attelage type S). 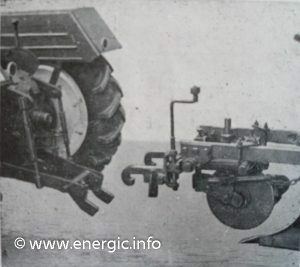 Low maintenance Mechanic/méchanique, lifting capacity of 250 kgs, The PTO/prise de force comes out of the back of the Dynabloc system, when lifted out of the way. 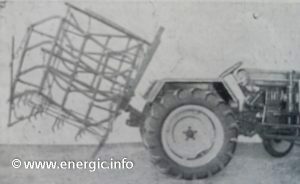 You can either tow from the hitch – chap/crochet on the Dynabloc or use the bar to lift implements/outils. 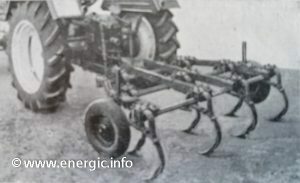 This system was fitted to the early 511/510/512 tracteurs as shown on the vigneron 511 photo above. 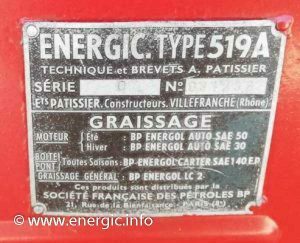 Dynabloc Hydraulic lift/revelage hydraulique. 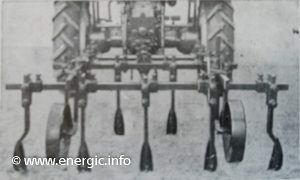 Using a bar lift system the type 519 – operating through pressure of oil through/in the Dynabloc, that can be infinitely variable for height, tolerance and pressure. 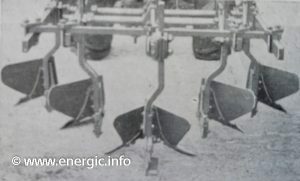 Energic patented attachment procedure for implements on the Dynabloc lift/revelage. 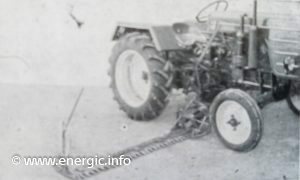 From 1, the positioning the tracteur lifting bar in – to the final hitch on position 5. 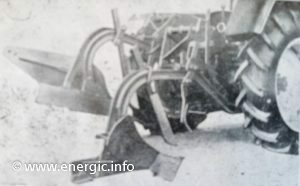 Energic tracteur 519 equipped with a Brabant Mono soc plough 1/2 turn (Energic-Huard). 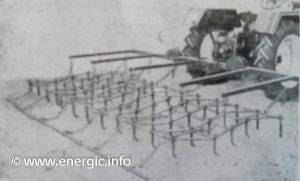 Energic Tracteur 519 equipped with a tri-soc plough. 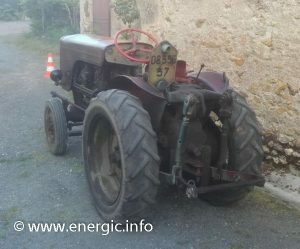 Energic tracteur 519 equipped with a vigneronne monte en debuttage. 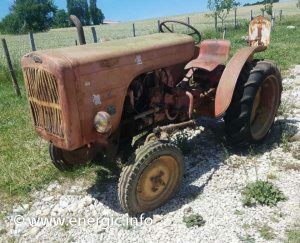 Energic Tracteur 519 equipped with a vigneronne monte en buttage. 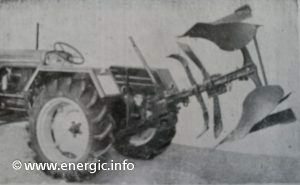 Energic Tracteur 519 equipped with a plough between the wheel for vignes. 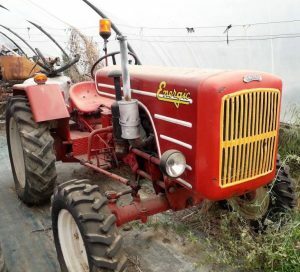 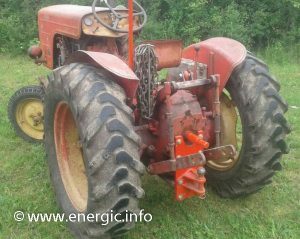 Energic Tracteur 519 equipped with a cultivateur 9 dents No 63. 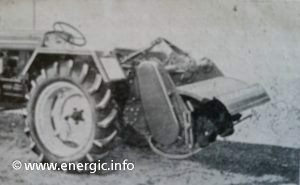 Energic Tracteur 519 equipped with a plough alternative. 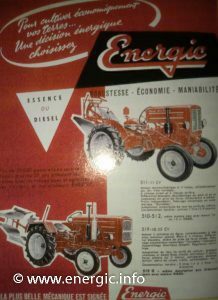 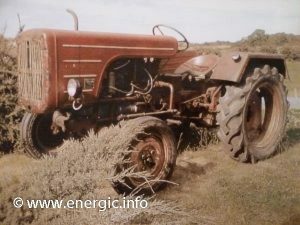 Energic Tracteur 519 equipped with a extirpateur 9 dents No 63. 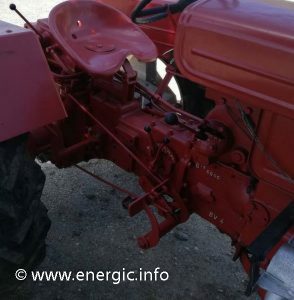 Energic Tracteur 519 equipped with a cultivateur rotational or fraise rotational. 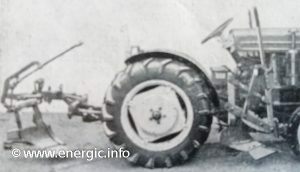 Energic Tracteur 519 equipped with a Herse 3 crps, 3m width. 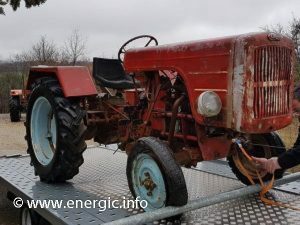 Energic Tracteur 519 equipped with a Herse 3 crps, 3m width folded for traveling. 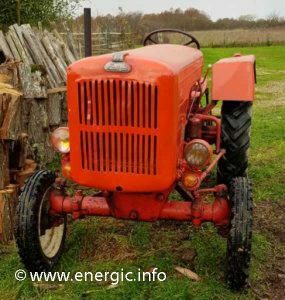 Energic Tracteur 519 equipped with hay/grass cutter..
Energic Tracteur 519 with a Hay cutter/moissonneuse and tier. 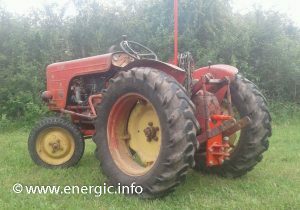 Energic tracteur 519 orchard work.